Due out June 17, 2014! 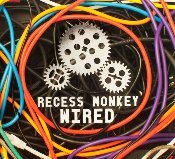 The three-person elementary school teacher band from Seattle entitled Recess Monkey is back again for a new summer album release just in time for summer called WIRED! This marks the group’s 11th album (wow) and they are gearing up for their usual summer break tour. The ‘Monkeys’ were interested in writing an album that focused on ‘maker kids’, that is our creative kids who likes to build and invent things from duct tape to electricity to just using our good ol’ imagination. This is a great and fun summer album that is geared towards kids 3-8 and great for the whole family. Anyone else ready for summer break? Then you and the kids are ready to listen to ‘WIRED’! We are huge Recess Monkey fans in our household and you can search my past reviews of this band. We love the ‘Wired’ album concept and Brooke loves the music’s execution, so it really is a WIN-WIN CD for a family about ready to be spending a whole lot more time together! Kids shout Hooray! Parents shake heads and thinks – how can I effectively keep my child entertained, educated and -yes, also important – not totally driving me nuts all summer! Hey, I CAN relate. I have a very determined preschooler going on 16 and sometimes even going backward to feeling like she is throwing that toddler tantrum from time to time. ‘Wired’ IS a great album for us and since Brooke and I are lyrics-freaks (yes, I started teaching her songs as soon as she could say Ma-Ma. Ha! -Brie is already helping me ‘learn’ songs, and the ‘Monkey’s new album is hard to beat for this summer’s children’s album line-up. Listen to the really amazing ‘Off the Grid’ and just imagine how two teachers from Seattle who honestly care about music, education and having healthy children and families wrote about families limiting their technology when we spend TIME Together, but also when we have so many other wonderful things to do and learn than stay connected through a computer. So take our ‘WIRED’ kids and turn them into Recess Monkeys this summer! I know we are! Recess Monkey Tour! Don’t forget to check out the SHOWS section of their website with their complete summer tour. You know, as schoolteachers, they have to get ready to go back to school by the time September rolls around, so catch them LIVE while you can!